Registration from May 15th to July 31th 2014. 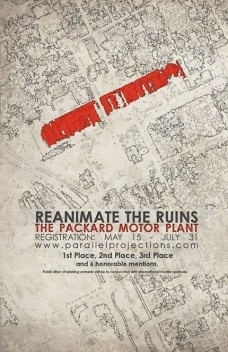 Welcome to Parallel Projection's global design competition, Reanimate the Ruins! This competition challenges architects, engineers, planners, artists and students from around the globe to rethink and reshape the ruins of Detroit’shistorical Packard Motor Plant. You are charged to investigate and propose a new dynamic and adaptive urban node that will reinvigorate Detroit. Rethink urban practices surrounding public transportation, sustainable systems, and spatial organization. The aim is to memorialize the Packard’s current ruined state, while simultaneously imagining a future that will heal Detroit technologically, socially and aesthetically. Author Wendell Berry wrote, “All good human work remembers its history.” Competition proposals should seek to embody this notion. We are asking not only for solutions to Detroit’s current woes, but also for a memorial to its dilapidated state, the evidence of its history. In this regard, you are charged to present a new vision for the Packard Motor Plant, which leaves a portion of the structure in ruins. Among the ruins, incorporate a transit center and museum to act as the nexus for your design intervention, attracting all other elements to them. The remaining program should include civic, residential, business and entertainment amenities. Participants must also consider recreational and public spaces necessary to support the program listed above. Design proposals should retain selective elements of the Packard Motor Plant, which provide unique insight into Detroit’s decline, while simultaneously envisioning a new, lively, and engaging urban node. Bend architectural norms to create new urban forms, which lend themselves to the confluence of residential, commercial and civic programs. Ultimately, people are the makers of place; create an environment that encourages human engagement and expression.